Peter Wright failed to build on his win over Van Gerwen in week two by losing 7-4 to Rob Cross in Newcastle last week. Wright was always trailing having found himself 3-0 down with Cross breaking his throw in the first and third legs of the match. Despite the defeat it was still a high-calibre performance from Wright. His match average of 102.32 and first nine dart average of 111.39 were his highest match totals from the opening three weeks. Wright exited both of the Players Championship tournaments last weekend in the early stages; he lost in the second round on Saturday to Wayne Jones and then suffered a first-round exit on Sunday to Dawson Murschell. Last week, Anderson lost 7-3 to Michael van Gerwen in a top-quality encounter where both players averaged in excess of 110. Anderson lost the last five legs of the match having led the match 3-2 courtesy of a 170 check out in a leg that Van Gerwen had started with two 180’s. Anderson certainly wasn’t without chances to win legs against Van Gerwen and had he been more clinical on his finishing, the match may have turned out differently. Anderson had first dart at a double in six of the ten legs and lost five legs in which he’d had double attempts. His checkout percentage against Van Gerwen was only 25%, and overall throughout the tournament he has a checkout percentage of just 28.3% which is the second lowest out of all ten players. Week four of the Premier League ends with a very tasty clash between two of the very best players on planet darts with a keen rivalry ensuring plenty of extra motivation to get the win. Both players performed to a high level in defeat last week and if we get more of the same it should be an enthralling match. Wright enjoyed good success in the 2017 Euro Tour events that were played in Germany and as a crowd favourite will enjoy plenty of support from the packed arena. Gary Anderson has a good overall record against Wright but in their most recent encounter in the semi-finals at the Grand Slam of Darts last November, he lost 16-15 despite having led 14-8. 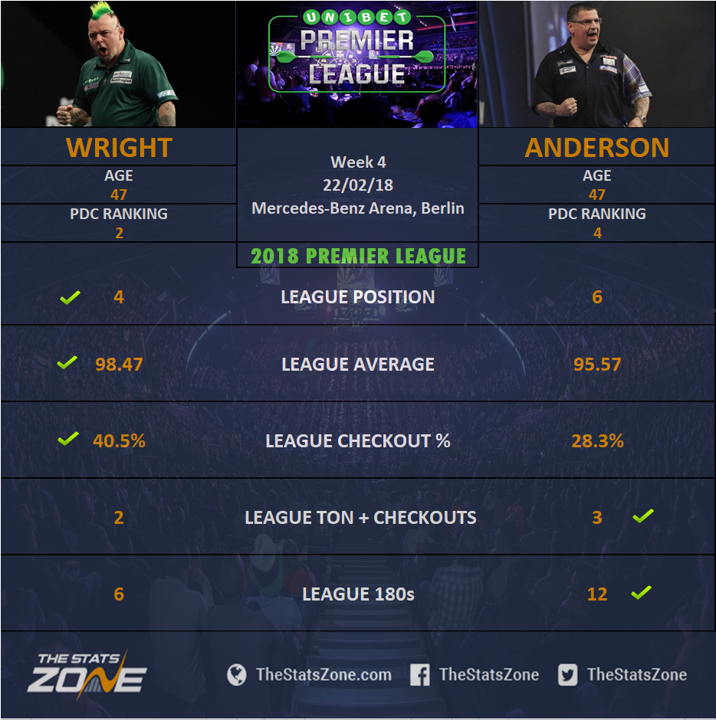 The previous match between the pair also went to a last leg decider with Anderson coming out on top 10-9 at the Champions League last September. Anderson will be very determined to try and get some revenge for his defeat against Wright at the Grand Slam and when he is in a very determined mood he usually produces his best performances. This could result in a win and two points for the Flying Scotsman against Snakebite.